Cut a slit horizontally through each fillet to form a pocket. Rub the salt onto the outer surfaces of the filets and place them in a shallow glass dish. Refrigerate covered for 1 hour. 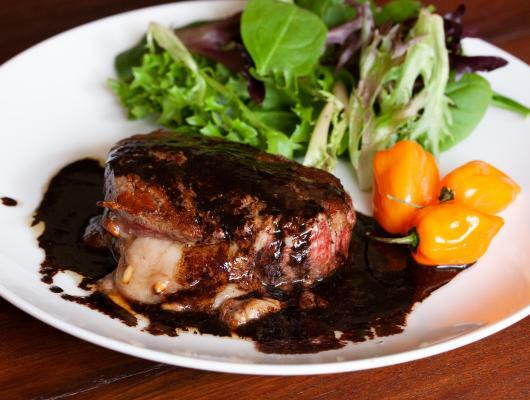 Put the wine, balsamic vinegar, thyme leaves and habanero into a blender and puree. Pour the marinate over the filets, rubbing the salt off unto the marinade. Cover and refrigerate for another hour. Preheat the oven to 300F. Take the meat out of the marinate and drain on paper towels. Reserve the marinate. Stuff about ¼ cup cheese and 1 tablespoon pine nuts into the pocket of each filets. Press together to keep the filling in. Heat a large skillet over medium-high heat. Add 1 tablespoon of the butter and the olive oil. When hot, add the filets and sear until brown, about 2 minutes. Turn the filets over and cook the other side until brown, another 2 minutes. Remove the filets to a baking sheet fitted with a rack. Pour reserved marinate into the hot skillet and cook over high heat, scraping the bottom of the pan to pick up any bits, and until the marinade is reduced to about ¾ of a cup. Strain into a saucepan and add the remaining tablespoon of butter. Keep warm. 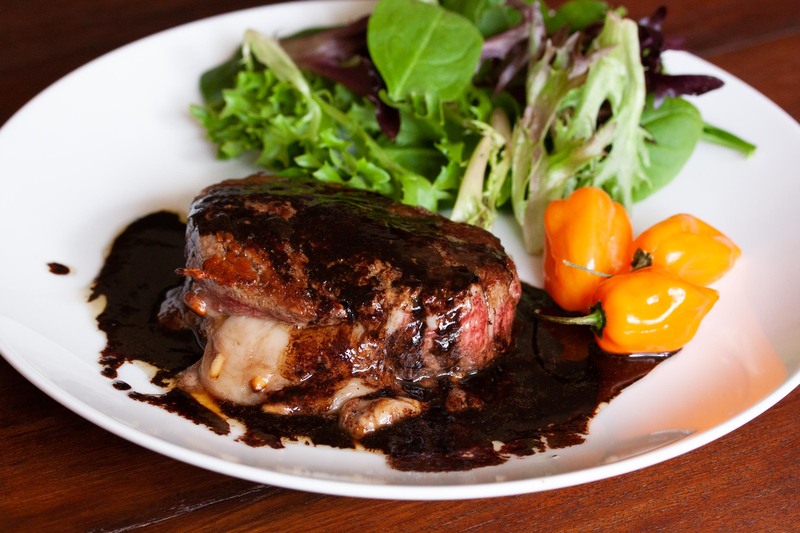 In the quest for a new and perfect recipe for filet mignons, I ran across this outstanding recipe of Marinated and Stuffed Filet Mignons with Merlot Habanero Sauce. I must say, we all were speechless at the first bite. The filet mignons were as tender as they can be. The cheese and pine nuts quite addictive. The sauce over the filets, which is the marinate simply reduced, was out of this world. A note of advise: when you handle the habanero chile either wear gloves or wash your hands immediately as it is quite strong. Do not be scared when you remove the lid of your blender and see smoke coming out. Absolutely normal. Also, use good Merlot wine.